It is important when beginning to make the changes necessary to overcome your Hypoglycemia that you begin to make a note of all the foods you eat, at what times and any reactions that youmight experience. The point of keeping a detailed log of what you eat is to get a good idea of exactly what it is that you are eating in order to see exactly where you need to make changes. A journal will enable you to get a clearer picture of the relationship that you have with food. It will show you clearly what you eat and it will enable you to map out when you use food for comfort and food as a drug to make yourself feel better. Some books and websites insist that hypoglycemics simply cut out certain foods without attempting to customise the diet for the needs of the individual. This means that many suffering from the condition deprive themselves of many foods unnecessarily not realising that many of these foods may in fact be ok for them to eat. Hypoglycemics as individuals cannot have a one size fits all approach to their diet this is not the most effective way to overcome the illness. 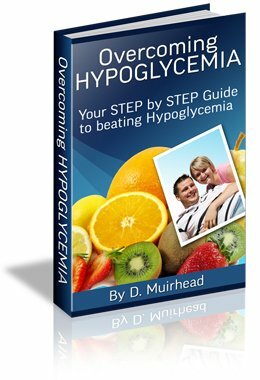 One of the most important secrets in overcoming hypoglycemia is to create an individualised diet plan they takes into account your unique needs and food intolerances. There is no point in a hypoglycemic cutting out all foods from a certain food group if they only have a reaction to one or two foods from this group. Some books and websites for example might say that Hypoglycemics should not eat any fruit at all. This advice however makes no sense considering that there are many hundreds of varieties of fruit that exist and it is unlikely that one suffering from low blood sugar should need to cut them all out indiscriminately. Instead a more sensible approach would be to monitor which fruits seem to have an effect on your diet and then cut or moderate these fruits only. How to create a food plan recording what you eat, when you eat it and any reactions you may have. Find this site helpful? Please help it to continue please donate to the site your support is greatly appreciated!!! I promise to use it only to send you Overcoming Hypoglycemia Ezine.